I can always tell, especially when these beauties surprise me. Even if I wanted to, there’s no way to ignore this! 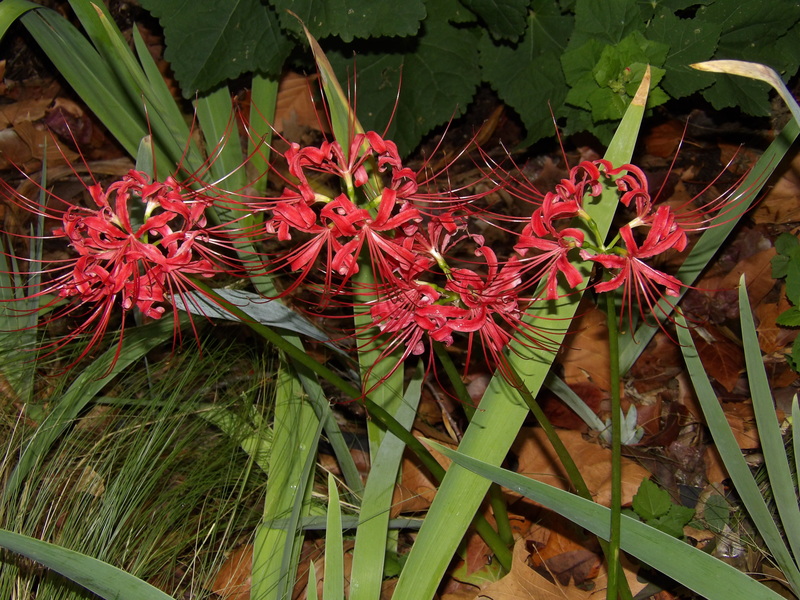 After our first decent rain in early September, the Red Spider Lily, Lycoris radiata, sends up its bloom stalk and in the following days, stunning blooms unfold. The long stamens give rise the the common name, spider. These petals and those extravagant stamens still sported rain drops on a recent morning after overnight rain. …and then they do this. 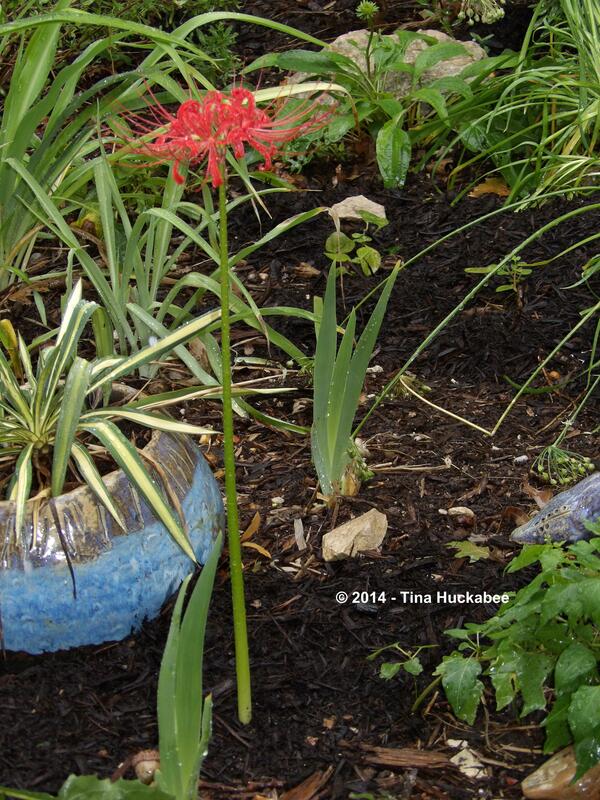 Usually there are several blooms, one atop each scape, rising from the dormant-since-last winter bulbs. After the flowers fade, the foliage will emerge–it looks similar to liriope foliage, except with a pale-yellow stripe up the middle. The foliage will stick around until sometime in late winter–I don’t really know because I never realize that they’ve gone. …while here resides a single bulb. I planted my bulbs three years ago and this is the second year they’ve bloomed. They seem happy here. So you know how I’m always preaching about planting for pollinators–bees, butterflies, and other assorted wildlife? 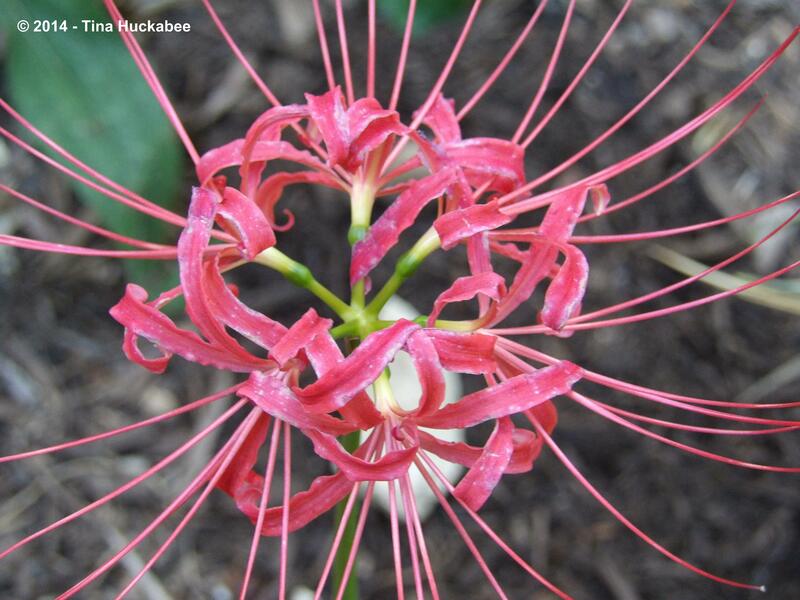 Well, forget all that for this one post: you plant Red Spider Lily for yourself. Go ahead, be completely selfish and shoot for style over substance. 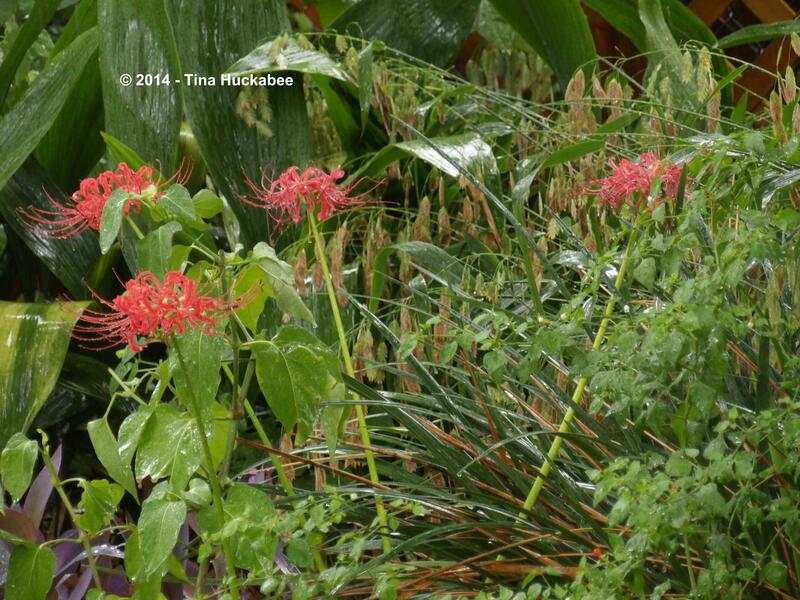 I’m sure in its native range, there’s something that feeds on Lycoris radiata–but not here. 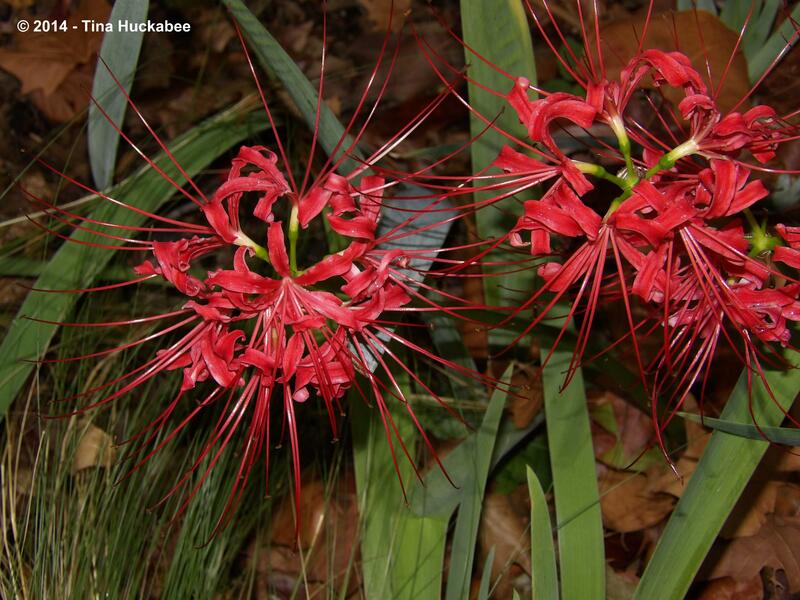 No sir, I haven’t seen anything so much as hover around the Spider Lily, wondering whether this is something worth sipping from or chewing on. This plant is for looks only–it’s a total fluff plant, indulging the pretty-plant-person resident in every gardener. 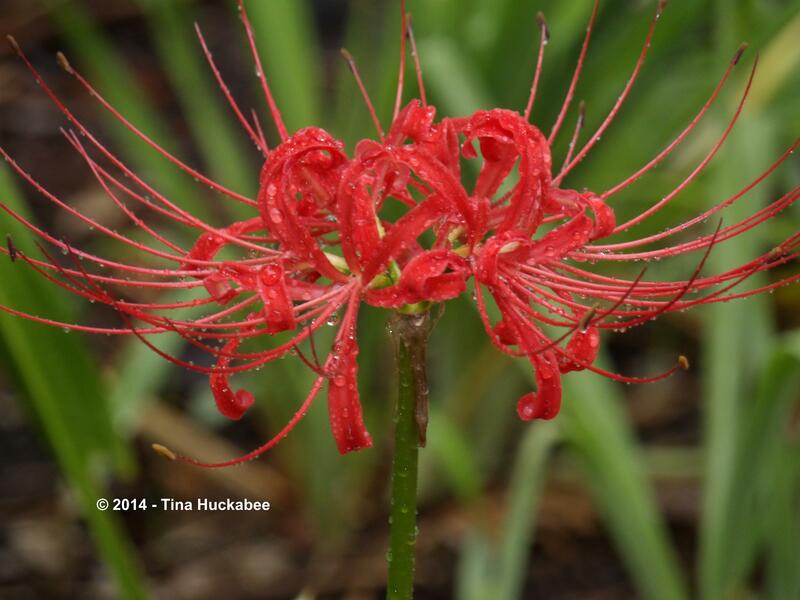 This entry was posted in Fall Bulbs, Lycoris radiata, Red Spider Lily, Uncategorized and tagged Fall Bulbs, Lycoris radiata, Red Spider Lily by Tina. Bookmark the permalink. 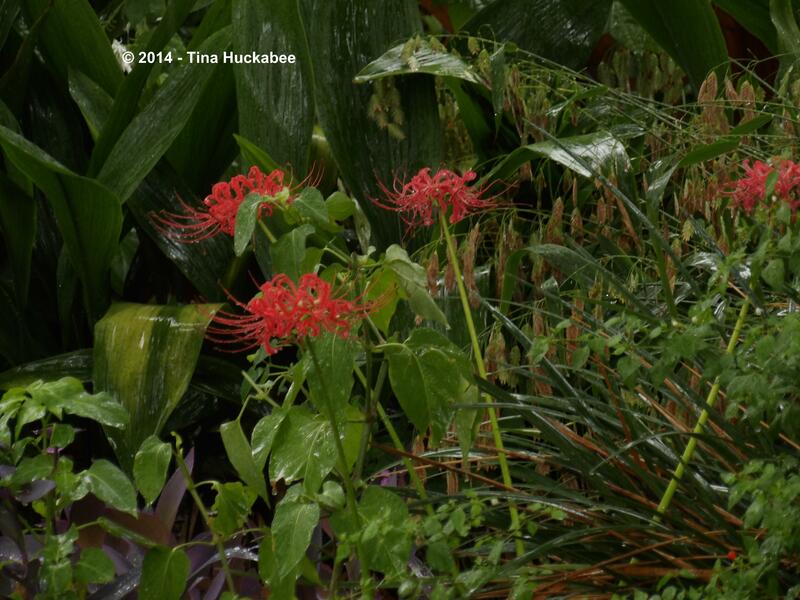 Lycoris foliage makes a great winter edging for paths. It lasts almost until other greens appear in spring. That’s a great idea! I really need more of these bulbs–so beautiful and easy. 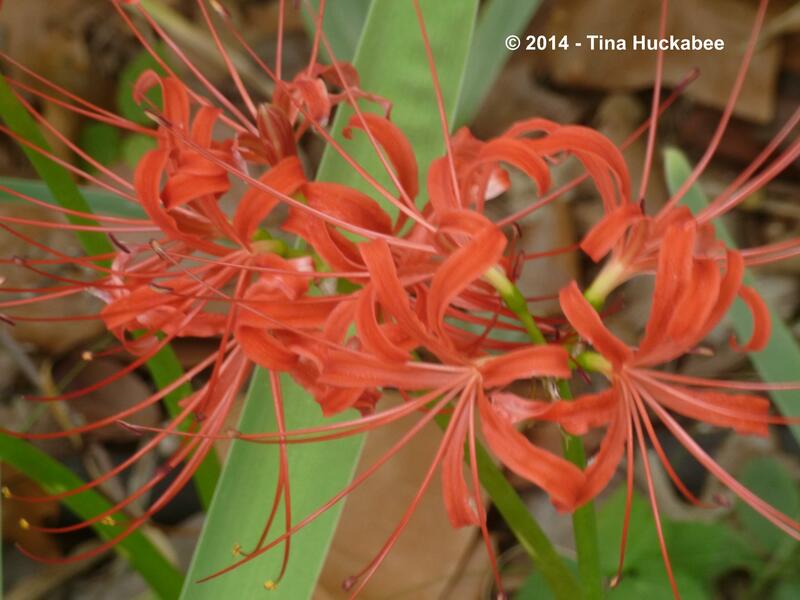 They are gorgeous Tina- a bit like my Nerine sarniensis but with whiskers. You are right it is good to grow lots of flowers which are good for insects but sometimes we can plant things just because they are beautiful. I love your header with the bees lined up drinking. tough and lovely. 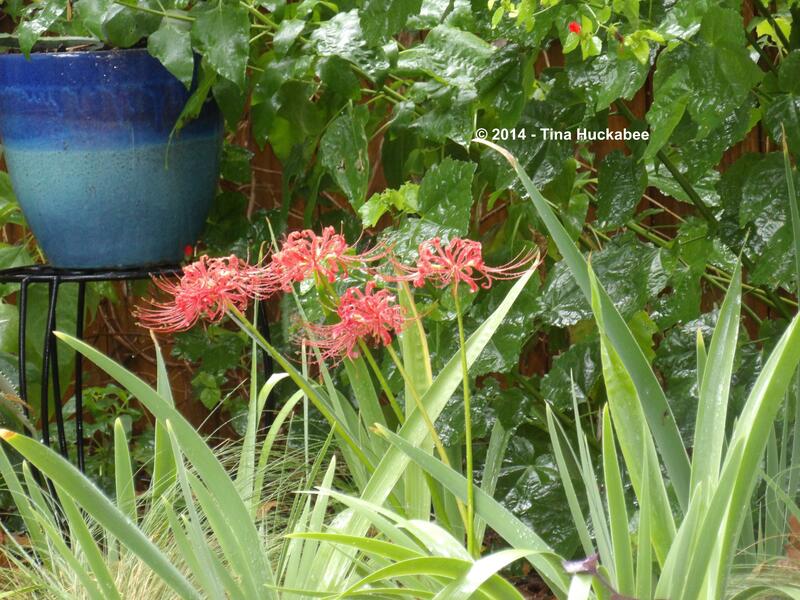 Aren’t the bees cute?That bird bath is their favorite watering hole. Now I know what these are called. Thankj you =) They were present in a shady corner when we first moved in. They are really tough plants. They are hardy. So pretty and tough. Enjoy them! 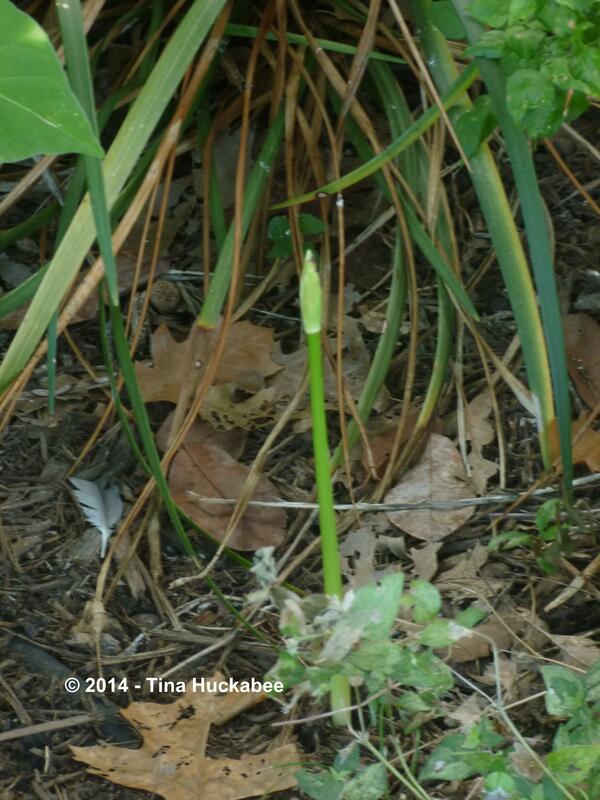 I still haven’t made a trip back to the nursery for spider lily bulbs. I’m pretty sure I wouldn’t get away with “only” bulbs and I need to clear more space in my beds before I buy any new plants. And I think it’s too wet for that just at the moment. Um, I mean IF I buy any new plants (“Hello, my name is TexasDeb and I might have a bit of a plant buying problem”). Ha,ha. “Hi. My name is Tina. It’s been 7 days since my last plant purchase. Grant me the serenity to know when to buy plants, the courage when not to buy willy-nilly, and the courage to know the difference. 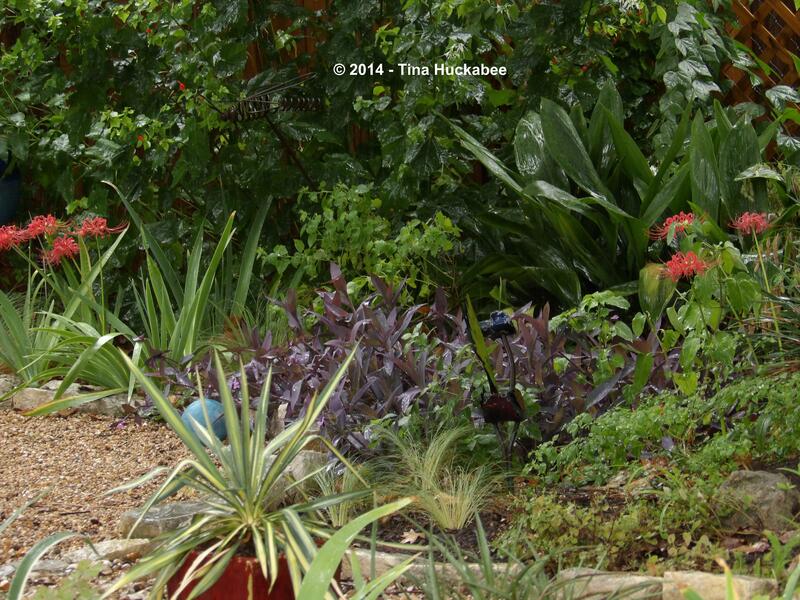 Having too wet soil is a nice change of pace, don’t you think? 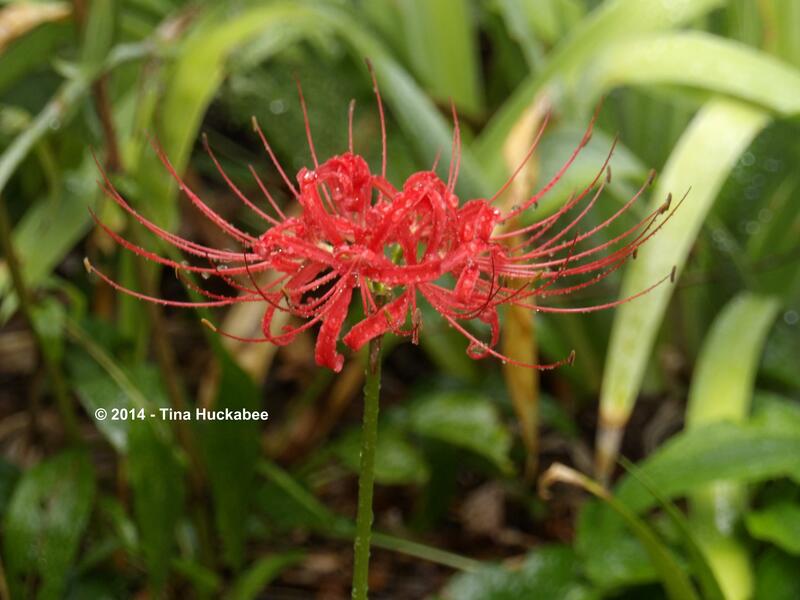 I’m planning to get more of the lycoris-just too pretty and easy. Just don’t know when my next nursery run will be. “Wait” is the key part of that formula in my experience. But when these beauties deign to bloom, it certainly is easy to enjoy them. Patience is a virtue with this plant. It is easy though: just pop in the ground, move on with your life, and be surprised sometime in the future. I have the pink ones — L. squamigera — in my garden. 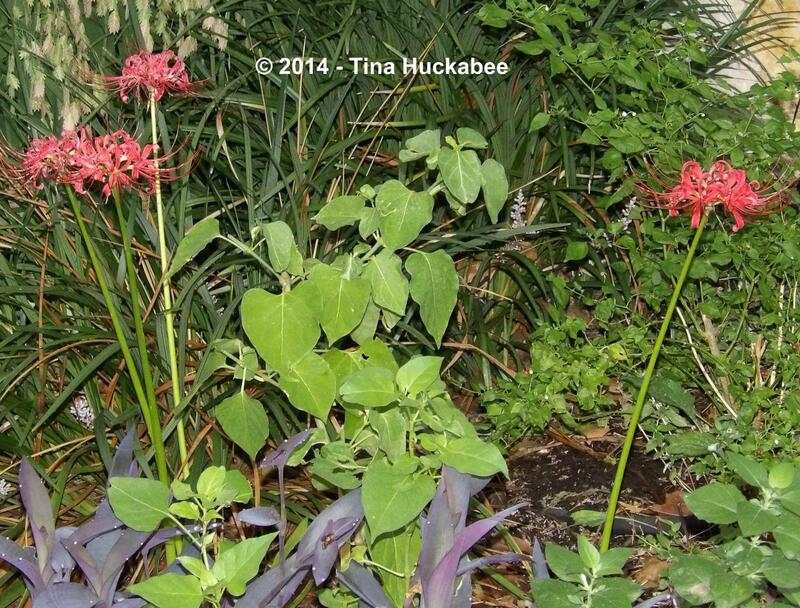 I love the way the foliage dies back and then the flower stalks poke up out of nowhere overnight! I wonder if I can grow these red ones or if my winters are too cold. I’m going to do some research. 😉 Pretty photos! Thanks, Beth. 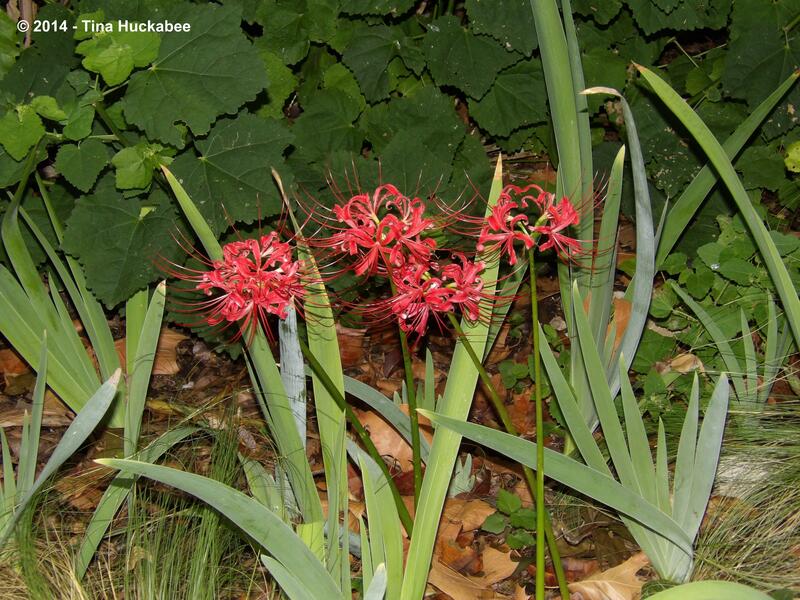 The Lycoris grow in zones 6-10–you’re in Wisconsin, I think? You just might be too cold. But the L. squamigera is lovely too!